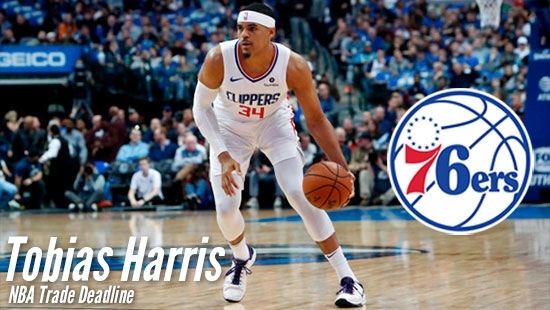 The Philadelphia 76ers have acquired Los Angeles Clippers F Tobias Harris in a blockbuster deal involving 6 players ahead of the NBA trade deadline (Thurs. February 7th 3pm EST). In addition to Harris, the Sixers also received C Boban Marjanovic and F Mike Scott. Philadelphia sent rookie G Landry Shamet, F Wilson Chandler, and F Mike Muscala to the Clippers. The Sixers also gave up a 2020 protected first-round pick (1-14), an unprotected 2021 first-round pick via the Miami Heat, and 2021 and 2023 second-round picks. 26-year-old Harris is averaging 20.7 points per game on 49 percent shooting this year. He is also hitting 42 percent of 3-point shots.